Species: Cucurbita moschata Duchesne, 1786. Cucurbita moschata is a species originating in either Central America or northern South America. It includes cultivars of squash and pumpkin. Cucurbita moschata cultivars are generally more tolerant of hot, humid weather than cultivars of Cucurbita maxima or Cucurbita pepo. They also generally display a greater resistance to disease and insects, especially to the squash vine borer. Commercially made pumpkin pie mix is most often made from varieties of Cucurbita moschata. The ancestral species of the genus Cucurbita were present in the Americas before the arrival of humans. Evolutionarily speaking the genus is relatively recent in origin as no species within the genus is genetically isolated from all the other species. Cucurbita moschata acts as the genetic bridge within the genus and is closest to the genus' progenitor. Butternut squash (Cucurbita moschata), also known in Australia and New Zealand as butternut pumpkin, is a type of winter squash. It has a sweet, nutty taste similar to that of a pumpkin. It has yellow skin and orange fleshy pulp. When ripe, it turns increasingly deep orange, and becomes sweeter and richer. It grows on a vine. The most popular variety, the Waltham Butternut, originated in Waltham, Massachusetts, where it was developed at the Waltham Experiment Station by Robert E. Young. Dorothy Leggett, widow of Charles Leggett, claims that the Waltham Butternut squash was developed by her husband, Charles Leggett, in Stow, Massachusetts, and then subsequently introduced by him to the researchers at the Waltham Field Station. Cucurbita pepo var. moschata(Duchesne) Duchesne. 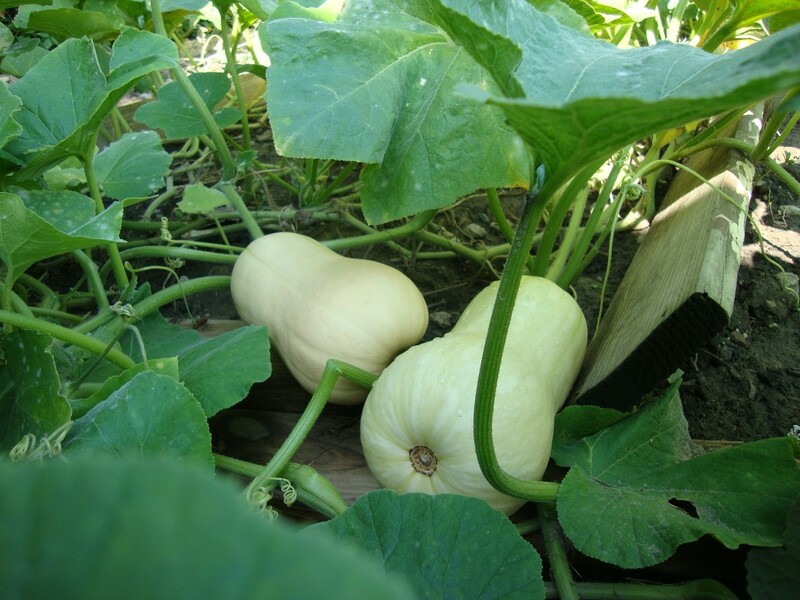 Cucurbita moschata is a creeping and climbing plant. It is herbaceous, annual, monoecious, lightly and densely pubescent, with short and long uniseriate trichomes and caulescent vegetative apices that are fairly reflexed. It has slightly angular stems. Its leaves have petioles of 30 cm or more, are broadly ovate-cordate to suborbicular, measure 20 to 25 x 25 to 30 cm, have white spots, are slightly lobate with three to five ovate or triangular lobules, have an obtuse apex that is briefly apiculate, serrate-denticulate margins and three to five ramified tendrils. Cucurbita moschata has pentamerous, solitary, axillary flowers. The male flowers have 16 to 18 cm pedicels and a very short calyx, are broadly campanulate to pateriform, expanded or foliaceous towards the apex, 5 to 13.5 cm long, with five divisions for up to one-third of their length. The female flowers have thick pedicels of 3 to 8 cm in length, and a globose, ovoid, oblate, cylindrical, piriform, conical, turbinate ovary. They have a very small calyx and sepals that are more often foliaceous than in the males, measure up to 7.5 cm in length and are of thickened style. They have three lobate stigmas. The fruit varies greatly in size and shape (generally following the form of the ovary): smooth or with rounded ribs, rarely verrucose or granulose, with a rind that is both thickened and durable and soft and smooth, and of a very variable colour - light green to uniform dark green or with cream spots, light to dark, or completely white. The flesh is light or bright orange to greenish, ranges from light to very sweet, is soft and generally not fibrous. It has numerous seeds which are ovate/elliptical, measuring 8 to 21 x 5 to 11 mm and which have a yellowish-white surface. Cucurbita moschata is a species originating in either Central America or northern South America. The most popular variety, the Waltham Butternut, originated in Waltham, Massachusetts (U.S.A), where it was developed at the Waltham Experiment Station by Robert E. Young. Dorothy Leggett, widow of Charles Leggett, claims that the Waltham Butternut squash was developed by her husband, Charles Leggett, in Stow, Massachusetts, and then subsequently introduced by him to the researchers at the Waltham Field Station. Butternut squash is a good source of fibre, vitamin C, manganese, magnesium, and potassium. It is also an excellent source of vitamin A and vitamin E.
According to the USDA National Nutrient Database, one cup of cooked cubed butternut squash (approximately 205 grams) contains 82 calories, 0 grams of fat, 22 grams of carbohydrate (including 4 grams of sugar and 6.6 grams of dietary fiber) as well as 1.8 grams of protein. Butternut squash is an excellent source of potassium, bringing in 582 milligrams per 1 cup (cubed) - more than a banana! + Units: μg = micrograms • mg = milligrams * IU = International units. Source: USDA Nutrient Database - Link to USDA Database entry. Consuming fruits and vegetables of all kinds has long been associated with a reduced risk of many adverse health conditions. Many studies have suggested that increasing consumption of plant foods like butternut squash decreases the risk of obesity, diabetes, heart disease and overall mortality while promoting a healthy complexion, increased energy, and overall lower weight. Getting enough potassium in your diet is just as important as lowering your sodium intake when it comes to maintaining a healthy blood pressure. According to the National Health and Nutrition Examination Survey, fewer than 2% of US adults meet the daily 4,700 mg recommendation.Also of note, a high potassium intake is associated with a 20% decreased risk of dying from all causes. The risks for developing asthma are lower in people who consume a high amount of beta-carotene, the antioxidant that gives certain fruits and vegetables their bright orange pigments. Look for other orange plant foods like papaya, apricots, broccoli, cantaloupe, pumpkin and carrots to increase your beta-carotene intake. Beta-carotene has also been shown to have an inverse association with the development of colon cancer in the Japanese population. Among younger men, diets rich in beta-carotene may play a protective role against prostate cancer, according to a study conducted by the Harvard School of Public Health's Department of Nutrition. Type 1 diabetics who consume high-fiber diets have lower overall blood sugar levels, while type 2 diabetics have improved blood sugar, lipids and insulin levels. One cup of butternut squash provides about 6.6 grams of fiber out of the recommended 21-25 g/day for women and 30-38 g/day for men. Butternut squash is also great for your skin because it of its extremely high vitamin A content, which is needed for sebum production that keeps hair moisturized. Vitamin A plays an important role in the growth of all bodily tissues, including skin and hair. As an added bonus, one serving of butternut squash provides over 50% of the required vitamin C intake for the day, which is needed for the building and maintenance of collagen that provides structure to skin and hair. Maintaining a high fiber diet helps to prevent constipation and promote a healthy digestive tract. Recent studies have shown that dietary fiber may even decreaseinflammation and improve immune function, consequently decreasing the risk of inflammation-related conditions such as cardiovascular disease, diabetes, cancer, and obesity. Increased fiber intakes have also been shown to lower blood pressure andcholesterol levels and enhance weight loss for obese individuals. Plant foods like butternut squash that are high in both vitamin C and beta-carotene offer an immunity boost from their powerful combination of nutrients. Some studies have shown that high-fiber foods may also offer improved immune function. Almost all the parts of the butternut squash plant; fruit, leaves, flowers, and seeds are edible. Although a fruit, butternut squash is used as a vegetable that can be roasted, toasted, puréed for soups, or mashed and used in casseroles, breads, and muffins. As in pumpkins, some hybrid squash varieties are generally subjected to insecticide powder or spray. Therefore, wash them thoroughly in running water in order to remove dirt, soil and any residual insecticides/fungicides. In Australia it is regarded as a pumpkin, and is used interchangeably with other types of pumpkin. Butternut squash finds common use in South Africa. It is often prepared as soup or grilled whole. Grilled butternut is typically seasoned with spices such as nutmeg and cinnamon, or stuffed (e.g. spinach and feta before wrapped in foil and then grilled). The grilled butternut is often served as a side dish to braais (barbecues) and the soup as a starter dish. Whenever possible, buy long neck butternut fruit as it contains more meat and fewer hollow cavities and seeds. Cut the stem end and slice the whole fruit into two equal halves. Remove central net-like structure and set aside seeds. Then cut into desired sizes. In general, wedges/small cubes are used in cooking preparations. - Being a member of pumpkin family, butternut squash has a pleasant nutty flavor and mildly sweet taste. Fresh raw butternut cubes may add special tang to vegetable salads. - It found favorite in both savory as well as a sweet dishes. It can be used in variety of delicious recipes as baked, stuffed, or stew-fried; however, eaten best by steam cooking in order to get maximum nutrients. - In Mexico, butternut squash bisque (soup) with added fruits, herbs or seafood is a favorite appetizer. - As in pumpkins, it can also be used in the preparations of casseroles, pies, pancakes, custard, ravioli, bread, muffins...etc. - Roasted and tossed butternut squash seeds can be used as snacks. - As in pumpkins and zucchini, squash flowers too can be stuffed with cheese or added in soups. Butternut squash has no known reported cases of allergic reactions, and may be safely used in pregnancy and in nursing mothers. However, being a member of cucurbita, some fruits may carry cucurbitacin toxin. It is therefore, bitter tasting butternuts should be avoided in the cookings.